"A delicious, hot Asian appetizer, great for dinner parties on a budget or a way above-average party dish. Pour edamame onto a platter and serve - it's nice to give each person a small dish to discard the soy bean shells." Heat peanut oil in a skillet over medium-low heat; add garlic. Cook and stir garlic until slightly browned, 2 to 3 minutes. Add edamame; cook and stir until glossy and puffed, 1 to 2 minutes. 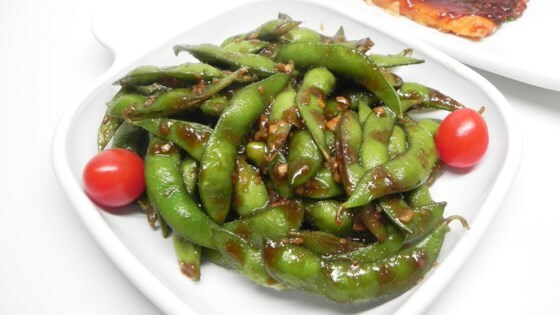 Stir black bean sauce into edamame until evenly coated and warmed, 1 to 2 minutes. Flavorful and quick quesadillas for a snack or meal! These turned out really good. Made as written except I added toasted sesame seeds. As directed I give it 4 stars. 5 stars with the addition of sesame seeds.